Where contracts allow, ocean carriers are starting to postpone deliveries of new ultra-large container vessels (ULCVs) in the face of the return of the twin challenges of cellular overcapacity and softening demand. Alphaliner claimed today that Cosco has deferred 10 of the 28 ULCVs it was due to receive this year to 2018 and Yang Ming has pushed back delivery of three 14,000 teu vessels into next year. Despite these deferrals, Alphaliner calculated there would still be some 1.5m teu of newbuild containerships entering service this year of which 1.2m teu is slated for delivery before the end of June. And it forecasts that January will be a record month for deliveries, with no less than seven 19,000-21,000 teu vessels expected to join the global fleet – equating to an extra 250,000 teu of capacity. They include the 21,413 teu OOCL Indonesia, the CMA CGM Antoine de Saint Exupery (20,776 teu), MOL Treasure (20,182 teu), Cosco Shipping Taurus (20,119 teu) and Marseille Maersk and Manchester Maersk sister ships (each 20,568 teu). All these behemoths are stemmed to join the Asia-Europe trade, and the challenge for ship planners will be to phase them into their nominated loops without causing a big spike in capacity and a negative impact on freight rates. Once the existing tonnage in these services has completed their voyages this month, carriers will look to deploy it onto other trades, resulting in a fresh surge of vessel cascading. 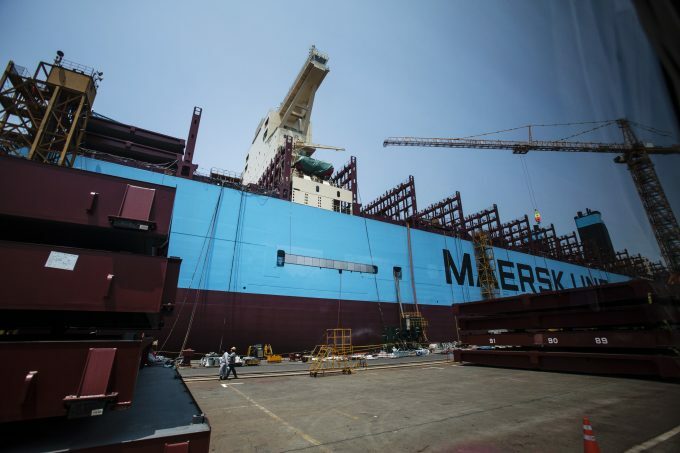 And the other 790,000 teu due to be delivered by the half-year point is likely to “trigger a cascade of smaller – though still fairly large – ships into secondary trades”, said Alphaliner. It suggested freight markets would be “severely tested” in March, expected to be the first of this year’s slack seasons, following the Chinese New Year and before the summer rush. The delivery schedule will also present renewed problems for large shipowners, since in addition to voiding sailings to match weaker demand carriers will also look to off-hire as much chartered-in tonnage as possible. Global cellular capacity is forecast to grow by more than 5% this year, based on 1.5m of new capacity deliveries and the expected further slowdown in scrapping – which is now estimated at just 350,000 teu this year, compared with 422,000 teu in 2017 and a record 665,000 teu in 2016. Lars Jensen, chief executive and partner at SeaIntelligence Consulting, agrees the liner industry could see supply and demand tipped further out of kilter by the armada of ULCVs being delivered this year. With new CTS data evidencing a declining growth trend of 3.4% in November, compared with the 5.2% global demand growth seen in the first three quarters, Mr Jensen noted an abrupt slowdown in growth in the Asia-Europe and transpacific trades. “Looking at a capacity injection in 2018, poised to be above 5%, the industry will be challenged if it cannot maintain the demand growth rates from the first nine months of 2017,” he said.